Leading computerized knitting machine manufacturer SHIMA SEIKI MFG., LTD. of Wakayama, Japan, together with its Italian subsidiary SHIMA SEIKI ITALIA S.p.A., will participate at the ISPO exhibition in Munich, Germany in February. SHIMA SEIKI is to be a corporate partner to the ISPO BRANDNEW Village, a special platform for promising newcomers to the sports industry. 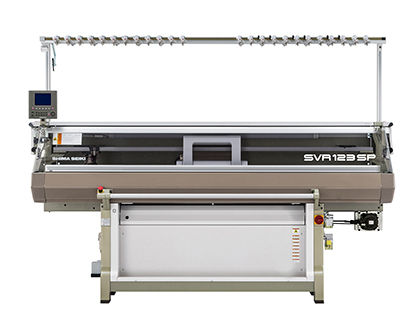 On display at booth BN05 in BRANDNEW Village will be the state­of­the­art SVR123SP computerized knitting machine that features a special loop presser bed, capable of producing hybrid inlay fabrics with both knit and weave characteris­ tics. Demand for such novel fabrics are very high across a wide range of applications including sportswear, innerwear, outerwear, uniforms and other functional clothing, as well as home furnishing and technical textiles. SVR123SP at ISPO Munich furthermore features the new i­PlatingTM option, capable of alternating yarn colors in any pattern, producing jacquard­like designs using plain jersey stitch. With i­PlatingTM, plating can be performed within the same course and for individual needles for even greater diversity in knit design. The latest sportswear samples produced on SVR123SP will also be on display, as well as revolutionary seam­free WHOLEGARMENT® knitwear that feature superior fit, comfort and style that are ideal for sportswear. The latest version of SHIMA SEIKI’s 3D design system SDS¬ONE APEX3 will also be exhibited. At the core of the compa­ ny’s “Total Fashion System” concept, APEX3 provides comprehensive support throughout the product supply chain, integrating production into one smooth and efficient workflow from yarn development, product planning and design to production and even sales promotion. Especially effective is the way APEX3 improves on the design evaluation process with its ultra­realistic simulation capability, whereby virtual samples minimize the need for actual sample­making. This realizes significant savings in time, cost and material, contributing to sustainable manufacturing. More News from Shima Seiki MFG., Ltd.